I came to Canada in 2004 and bought a car a year later. Even though I had been driving accident-free for 9 years in two other countries, insurance companies here treated me as if I was a complete novice on the roads. My monthly insurance premium was $700, higher than my monthly car payment. It took me 10 years of fault-free driving – not a single speeding ticket and no accidents – to get my premium down to about $160 a month. If Sachin Mahajan arrived in Canada today, he’d have another option, thanks to a Internet-of-things (aka as Machine to Machine) technology called User Based Insurance (UBI). Very simply, the insurance company would give me a small device to plug into the diagnostic port of my car. This device would monitor how and when I drive and upload the data to the insurance company. Then, instead of basing my premium on their generic profile of a young man living in a large city, they could have based it on real information. The UBI device would have told them that I don’t exceed the speed limit and hardly ever drive during rush hour. Those two factors could have reduced my premium significantly. The company might also have been able to tell me, for example, that if I started braking sooner than I usually do, I could lower my premiums even further. And if I started doing more rush hour driving, they could have suggested that I avoid certain times on the road. Some Canadian insurance companies have been offering UBI for a while now, promising potential savings as high as 25%. It’s just one example of how IoT is giving organizations access to information they simply didn’t have before, and how this information is allowing them to change the way they do business. Like other M2M solutions, UBI depends on wireless connectivity to work. 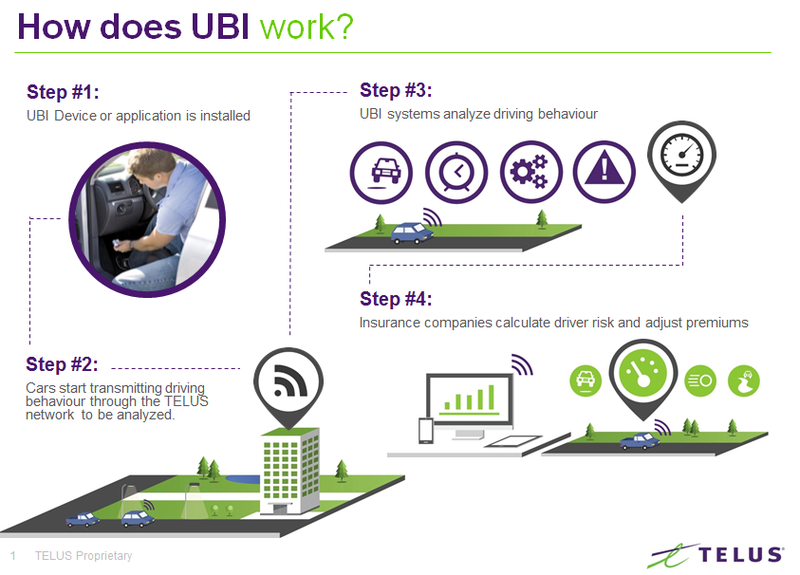 But even though 4G wireless is available to almost the entire population – TELUS Communications has Canada’s largest 4G network, reaching 98% of the population1 – some insurers have been offering UBI on older technology. There’s one that’s even using 2G. However, it’s important to ensure that solutions are future-proof and operate on a network you’ll be able to rely on for many years to come. That’s because the connected car has arrived and with it, M2M solutions that are literally changing the way people and cars interact. Phase 1 of the connected car started with basic integration between your car and your wireless device, allowing you to play music or talk to people using your car stereo, via Bluetooth. Phase 2 includes GPS directions, locking or unlocking your car, getting remote diagnostics etc . Phase 3 will be even more exciting. Soon, your car will do more than tell you when it needs servicing. It’ll be able to make the appointment for you, and remind you to take it in. Your car will also become its own wireless hotspot, allowing you to work anywhere on your Wi-Fi enabled tablet or laptop, or stream music directly to your audio system without going through your smartphone. Most of these new technologies will require 4G or 4G LTE connectivity, so why would you limit the possibilities by going with an older wireless technology? Actually, Phase 3 is already here in some ways, and there’s one example that demonstrates the art of the possible. A while ago, Tesla, the leading electric car manufacturer which incorporates a ton of IoT Sensors in each car, needed to change one of the features accessible to owners. This feature allows the driver to lower the car for better aerodynamics, but at its lowest level, the vehicle was more susceptible to hitting objects in the road. Traditionally, a fix would have meant a recall that could have cost millions. But Tesla simply issued an online update that was fed to every car when the owner plugged it in for overnight charging. Within a day or two, and at minimal cost, the lowest available level on every one of those cars was half an inch higher. You can read about it here.